Within a corporate environment any business will aim to create an atmosphere that benefits its workers and ultimately the company itself. Many would not think to use Digital Signage as the first solution to doing this but there actually many ways in which installing Digital Signage can benefit a commercial organisation. Digital Signage can provide a way to deliver information directly to staff. A business would be unwise to underestimate the advantages that a workforce that feel informed and included can bring. A company can utilise a Digital Signage display like an ultra-modern pin board. A company could choose to display statistics for example like sales. It can be more personalised though and could be used to feature individual workers and their successes, or a corporation can use it to display company news like social events that will strengthen team bonding or motivational messages that can lift morale for staff. In a stuffy corporate environment an Android Advertising Display with a tempered glass front, steel enclosure and bright display, will definitely stand out among all the standard computer monitors. Digital Signage does not need to just be restricted to the office though, businesses can use Digital Signage to dazzle visitors and customers alike with Freestanding Android Digital Posters and LCD Video Walls being very popular in office lobbies. Here you can communicate your corporations brand and its values with your own images and videos. Our POS Advertising Displays can also be used as a room signage system when upgraded to network so more advanced scheduling and remote updating can occur, staff and visitors can then know what meetings are going on in which rooms at any given time. Digital Signage can now also make an impact on business meetings themselves. From desktops, to laptops, from smartphones to tablets there are lots of different ways that professionals conduct business. Getting all of these different devices to sync up can prove troublesome but that’s where our Interactive Touch display with Dual OS comes in. 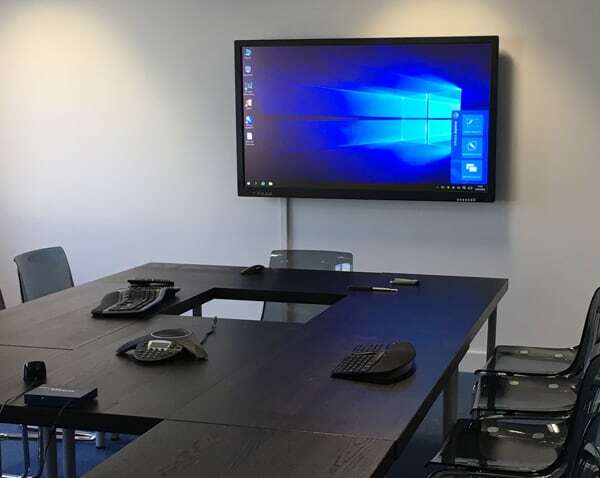 Designed with collaboration in mind the display can help with the sharing of files and documents in meetings so that they are much more productive. By being more interactive the input and cooperation of all participants at meetings should soon follow. When you think of places you would you expect to find a Digital Signage display, a corporate office is not one of the first places would you expect to find it. As we have discovered though that Digital Signage displays can serves multiple needs in an office block. When placing a Digital Signage screen into an environment like this you are investing not only into your workers, but securing your company’s future too.